Old things call to me. Ramshackle barns, well-worn leather jackets, bypassed highways – each draw my attention and induce romantic notions of a past either real or imagined. Such an affliction can cause men to do irrational things, like buying a 34-year old Honda CB750SC that doesn’t run. With a fragile confidence and faith in the Internet’s ad claim that the electrical ailments were a simple fix, I dragged the old first-generation Nighthawk home and set to work. After few weeks of joyous man-cave tinkering, the classic inline-four awoke. Boxes of new parts found their home replacing neglected components, and a mild facelift turned the old standard Universal Japanese Motorcycle into a café racer-inspired vintage superbike. Several miles turned close to home assured me the old girl was truly resurrected from the dead, and it was now time for a long shakedown ride. To mark its rebirth, the 750 deserved a special road and destination. Like the old Nighthawk, the Tapoco Lodge outside Robbinsville was reborn after a period of disuse and today enjoys modern refinements along with its vintage appeal. 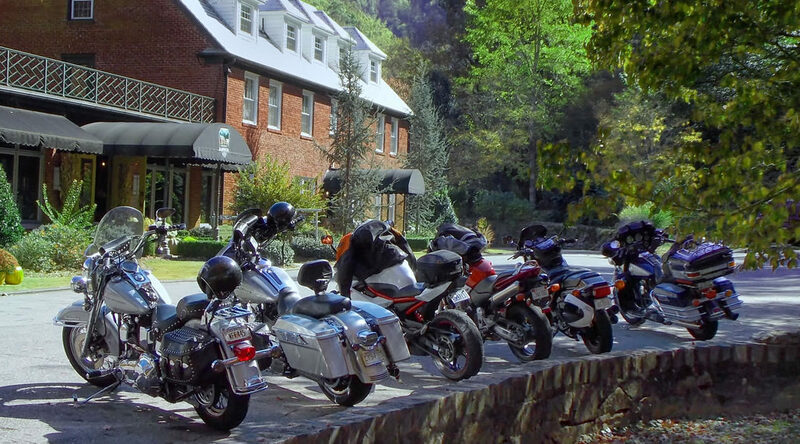 The lodge attracts riders from across the region due to its central location near Western North Carolina’s best motorcycling roads. The riverfront patio would make the perfect destination for a weekend ride, and one of my favorite roads heads that direction. On a brisk Saturday morning, the Nighthawk fired to life with some choke and a bit of throttle. Along with the antique bike, I donned my 25-year-old Hein Gericke leather jacket, something I acquired in an online auction recently because as a younger man, I lusted over the same German motorcycle jacket hanging in a dealership lobby with a just-too-expensive-for-a-college-student price tag. I meet up with two old friends for this shakedown run. Better to have backup if the old Nighthawk does let me down. Harvey Conner has ridden motorcycles of all types since childhood, and Victor Johnson just began riding last year. 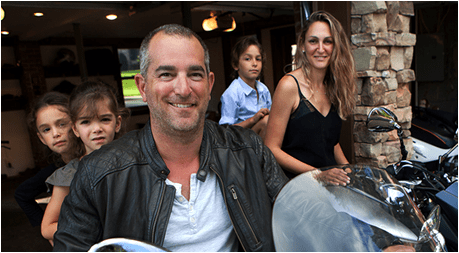 Conner rides a 2007 Honda 919 roadster, a bike with at least a spiritual connection to Honda’s first superbike, the CB750. Johnson’s Yamaha FZ6R reminds me of my first motorcycle and its ancestor, the Yamaha FJ600. With our trio of Japanese four-cylinders singing almost in unison, we roar off toward Franklin. Wayah Road begins near U.S. 64 just west of Franklin and crosses the mountains to reach Nantahala Lake and U.S. 74 in the famed river gorge. From there, U.S. 129 leads to Robbinsville and the lodge. 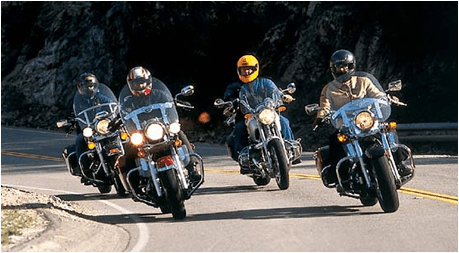 “Have you done Wayah Road?” is one of those questions seasoned motorcyclists ask one another, kind of a secret handshake to identify each other as a fellow connoisseur of roads. Little traveled and tucked away from more famous routes, Wayah Road offers technical switchbacks and flowing S-curves through the wilderness. We pause at the Lyndon B. Johnson Job Corps Center before heading up the mountain into the forest. The center, formerly the old Civilian Conservation Corps Camp Arrow Wood, was the first Job Corps center activated under LBJ’s war on poverty in 1965, according to the U.S. Forest Service. To this day, it operates under the Department of Labor providing approximately 200 disadvantaged youths with vocational and academic training. Deeper into the Nantahala National Forest, trees begin to envelop the shoulder of the road. In sequence, our three bikes lean one-by-one as each turn unfolds, a seemingly choreographed ballet. At the crest of the ridge, we find Nantahala Lake and pause before returning to population. Wayah Road follows the eastern shore of the lake before descending into the Nantahala Gorge. Along the roadside, trout fisherman in waders glance up from their rods and tackle boxes as the bikes buzz past. At the river bottom, we turn on U.S. 74 to begin our climb up the other side of the gorge on U.S. 129 toward Robbinsville. 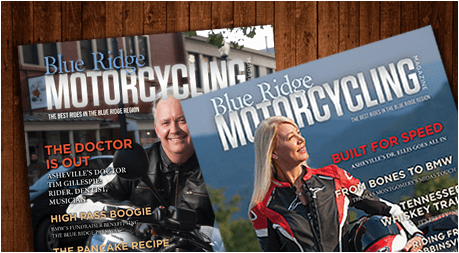 This small mountain town’s population of 600 can easily double during the summer as motorcyclists and car enthusiasts converge to enjoy the roads and scenery including the Cherohala Skyway, Moonshiner 28 and the Tail of the Dragon. We push northward to Lake Santeetlah. Here the Skyway begins, running near the grave of the great Cherokee Chief Junaluska. Historians say the Indian leader once saved the life of Andrew Jackson during the War of 1812 only to see his bravery rewarded by being forcibly removed from North Carolina on the Trail of Tears decades later. Junaluska would make his way back from Oklahoma to live out his days on land near Robbinsville given to him for his service to the nation. Just thirteen miles past the Skyway we spot the Colonial Revival-style buildings and assorted patio tables to across the Cheoah River. An impressive iron gate welcomes visitors to the Tapoco Lodge, and we park the bikes near a low rock wall. Dismounting, I notice the Nighthawk’s left side cover has dripped a small amount of oil on my boot. Just more vintage charm, I shrug. Tapoco Lodge, built in 1930 to house workers for the area’s hydroelectric projects, takes its name from the Tallassee Power Company, TA-PO-CO. The fully renovated lodge offers riverside dining, multi-room suites and private cabins for riders enjoying the region. “We do host a lot of car clubs because we’re so close to the Dragon. 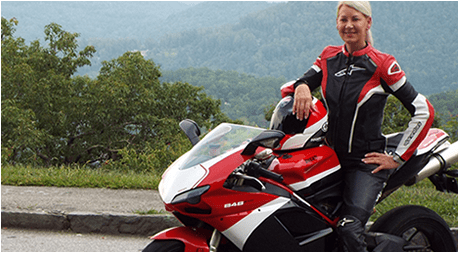 We do get lots of motorcycles as well,” she said while adding reservations for lodging are recommended during the summer riding season. In addition to the restaurant, the lodge features hiking trails, a movie theater, tennis, shuffleboard courts and covered motorcycle parking. Pizza, beer and the warm afternoon sun prove to be a popular choice as we join other patrons to watch the sports cars and motorcycles heading to-and-from the nearby Cheoah Dam — made famous in the 1993 movie “The Fugitive” — and the start of the Tail of the Dragon. My vintage Honda fires up without hesitation as we head for home along the main highways. Those original fears of buying a non-running old bike now become pride in resurrecting such an enjoyable machine. We switch our riding order and I take up the sweeper position at the rear of our formation. Shortly after merging onto Interstate 40 in Haywood County — moving fast to beat the approaching darkness — I feel the Nighthawk start to lose power. One of the items remaining to be fixed on the old bike is the fuel gauge. I watch helplessly as my riding partners disappear into the traffic-filled horizon as the Honda coasts to the shoulder.